An amazing Merlino's cut Christmas tree featured in a photoshoot for Master's Home Improvement. Our freshly shaped and cut Monterey Pine Christmas Trees are famously distinguished by their amazing scent. Grown in the Blue Mountains region, our Monterey Pine's are cut directly from the ground and brought to our warehouse in Sydney every day leading up to Christmas. Cut christmas trees are at their best within their first 2 weeks, but can last up to 4 weeks. Remember to keep them in water to improve their longevity. Under 7.5ft (~228cm) – Limited stock. Under 8ft (~243cm) – Limited stock. Under 8.5ft (~259cm) – Limited stock. Over 8.5ft (~259cm+) – Limited stock. 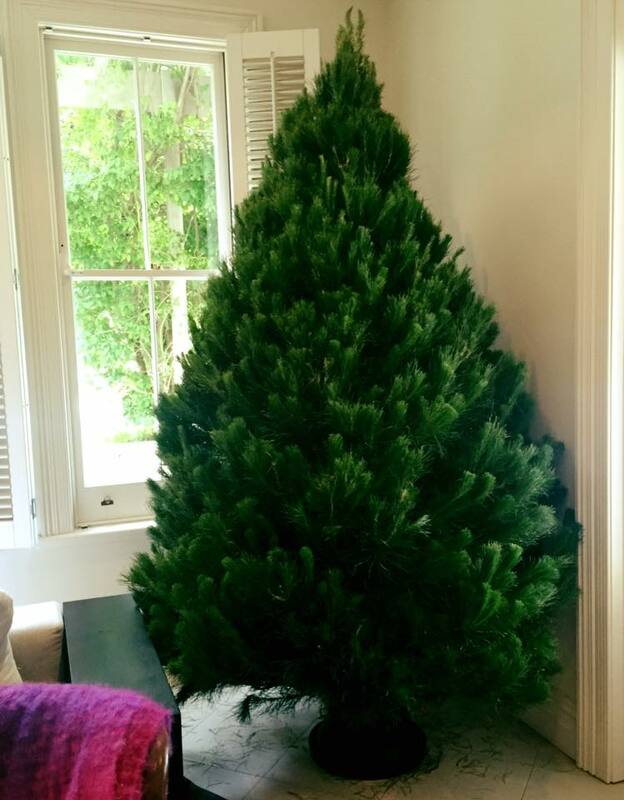 Cut Christmas trees are available for purchase in our Sydney Store. Please call us prior to visiting our store to ensure stock availability. Our farms have been affected by the drought & we have limited stock for Cut Christmas trees 7ft and over. As we cannot guarantee the supply, we do not take pre-orders for our Christmas trees. Our Christmas tree netting machine wraps, compacts and helps to protect your tree for the journey home. The netting also helps to keep your car cleaner from the loose Christmas tree needles. We promise that watching your cut Christmas tree being net is as exciting as finding your perfect Christmas tree! We support the Sydney Children's Hospital, Randwick, for a gold coin donation we will kindly provide netting of your real Christmas tree. Once Christmas is over and you've packed away the tinsel, lights and decorations, you may not be sure what to do with your real christmas tree? Recycling your Christmas tree ensures that it does not end up in land fill.